Gliderpole has a sharp new unibody aluminium bracket design. 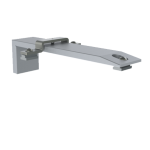 The ultra low profile design of these brackets maintains the sleek linear appeal of the Gliderpole system. This style has reduced height vertical back plates to keep the appearance discreet. 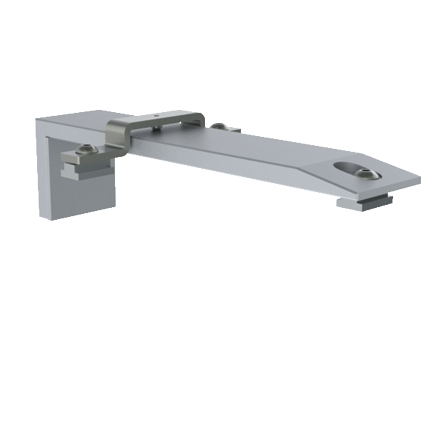 The brackets are profiled in aluminium and the integrated back plates have slotted fixing points to simplify installation. A clever, sleek magnetic cover plate gives the design a pleasing and clean finish. The bracket secures to the top of the front track through set screws and the rear track is suspended from a ‘track bridge’, with it’s position on the arm being adjustable. Projection to track centre: Front 140mm (5 1/2″) – Rear Variable .